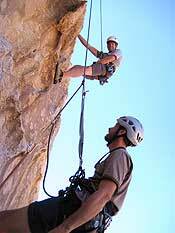 Basic Rock Climbing class at Joshua Tree. If you have never done any climbing, or need a refresher, here's where to start. 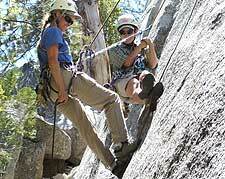 This is an introduction to the world of rock climbing with an emphasis on safety and fun. 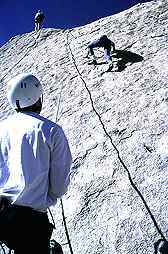 The class covers the absolute essentials for climbing steep rock and is a valuable course for those wishing to pursue mountaineering. 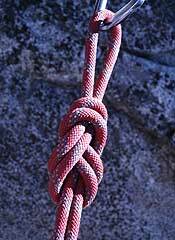 Course itinerary: equipment, knots, anchoring, belaying, communication signals, rating system, climbing techniques, and rappelling. Classes are taught on low-angle, moderate rock suitable for novices. After reviewing fundamentals (knots, anchoring, and belaying) you'll complete a progression of climbs where a broad range of more challenging climbing techniques are encountered, from the subtleties of edging and smearing used in face climbing, to jamming and liebacking used in crack climbing. Protected by a top-rope, each student is given personalized coaching and is allowed to progress to the limit of their ability. This class also includes an introduction to anchoring fundamentals using nuts and camming devices. 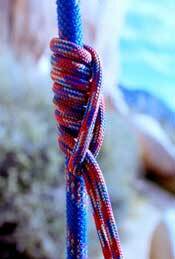 You'll learn the Klemheist knot in our Rescue One class. This class provides you with the essentials to perform basic self rescue skills for you and your partner. The itinerary includes: friction hitches for slings and cord, improvised rope ascension, backing up rappels with an auto block knot, how to rescue a fallen climber using an auto-locking (ie. Gri-Gri) device, lowering system with a re-directed auto-locking device, lowering system with a munter hitch backed-up with an auto block knot, the tandem rappel system, and the basic 3 to 1 "Z" raising system with an auto-locking device. Practicing the rescue of a fallen climber, Rescue Two class at Joshua Tree. This class teaches you the more complex rescue systems that must be accomplished without the aid of an auto-locking (ie. Gri Gri) device. The itinerary includes: the belay escape, how to rescue a fallen lead climber, rigging a 3 to 1 and 5 to 1 raising system, and lowering systems with a knot pass. Prerequisite: Rescue One or equivalent. 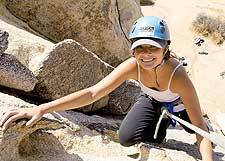 Lisa Lafortune enjoying her rock climbing class at Joshua Tree. Photo by Hoan Dolinh. Our most popular beginner's course, this seminar combines Basic Rock Climbing on Saturday with Intermediate One on Sunday, allowing you to maximize your learning capacity during one weekend. 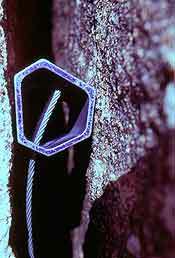 The stopper is one of the most common rock climbing anchors. This course curriculum is specifically designed to give you the ability to quickly assess your gear placements and anchor systems, based on sound principals. 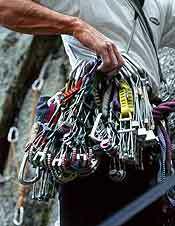 The "rack" is the complete assortment of rock climbing gear carried by the leader. This two-day class focuses on leading fundamentals. You'll learn what it takes to become a competent leader: confidence in technique and ability to place reliable protection and sound anchors. You'll practice placement and removal of all the various state-of-the-art protection devices, with pointers from your guide, and, under close supervision, and top-rope protection, you will execute simulated lead climbs. Placing gear on the lead, use of slings to reduce rope drag, proper carabiner clip-ins and alignment, belaying strategies and rope management for multi-pitch climbs, and route finding skills are among the topics covered. Limited to a maximum of three students. Prerequisite: 2-Day Anchoring & Climbing or equivalent. Students practicing rescue techniques during our Rescue class at Idyllwild. Combines Rescue One and Rescue Two for a comprehensive self-rescue class that covers virtually every scenario you may encounter while climbing. Crack climbing connoisseur Erik Kramer-Webb at Indian Creek. Joshua Tree is the perfect place to improve your crack climbing skills. In this two day class you will learn the techniques required to climb a wide variety of crack sizes, including: thin cracks, hand cracks, off widths, chimneys, dihedrals, and flaring cracks. Your instructor will set up top ropes on crack climbs mostly in the 5.6 to 5.9 range. The skills covered in the class will include: finger locks, ring locks, hand jams, fist jams, hand stacks, arm bars, chicken wings, toe jams, foot jams, heel-toe jams, foot stacks, stemming, laybacking, and the undercling technique. When is it better to jam and when is it better to layback? When is stemming the best option? Is it better to jam with thumbs down or thumbs up? Should you rest with elbows bent or elbows straight? Should you lock off low or high when placing or cleaning protection? Mixed crack and face routes. 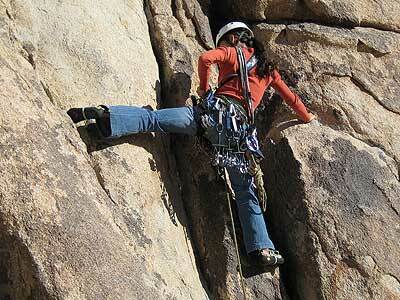 Terri Condon leading a trad route at Joshua Tree. Combine the 2-Day Leading with Rescue One for a comprehensive three-day leader's class. 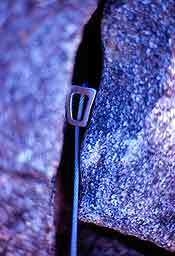 The spring loaded camming device is one of the most useful anchoring devices for rock climbing. Our most comprehensive beginning seminar combines the 2-Day Rockcraft Seminar with the 2-Day Anchoring & Climbing. Climbing on consecutive days in the best way to refine technique and quickly progress. Start with the 2-Day Anchoring & Climbing then continue with the 2-Day Leading for a thorough course covering everything from rigging top-rope anchors to the fundamentals of Lead Climbing. 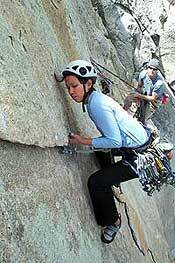 Angelina Kalianda leading The Vampire, a 5.11 rock climb on Tahquitz Rock. Photo by Tony Grice. Combine the 4-Day Anchoring & Leading with Rescue One on day five for our most comprehensive course. Big Wall student Michelle Kemmer practicing aid climbing technique on The Pirate at Suicide Rock. This two-day course teaches the famed "Yosemite Method" of direct aid climbing, useful to anyone who aspires to climb the big walls. 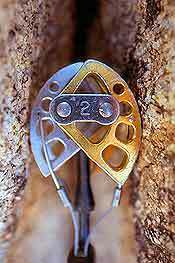 Stressing simplicity and safety, we'll cover various types of direct aid placements, jumarring techniques, leading and cleaning aid pitches, establishing hanging belays, hauling heavy loads, tension-traverses and pendulums. 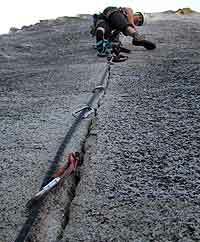 Taught by a veteran Yosemite Big Wall climber, this seminar will save you valuable time and reduce the frustration involved in learning the secrets of big wall climbing. Peter Croft is one of America's legendary rock climbers, and Bob Gaines is one of Joshua Tree's most experienced guides, with over thirty seasons guiding at Joshua Tree National Park. Bob's route knowledge and selection skills, combined with Peter's exceptional technique and expert coaching ability, will give you the ideal environment to break through to your next level. Designed for experienced rock climbers with ability to follow 5.8 to 5.10 routes, everyone is guaranteed a challenge. Join Peter and Bob for a memorable weekend of Joshua Tree's classic rock climbs. 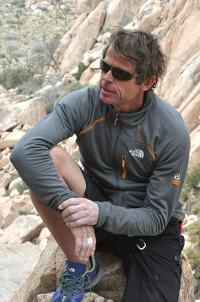 Peter Croft is now offering private instruction and guided climbs at Owens Gorge. Located near Bishop, California, the Gorge has over 500 routes ranging from 5.6 to 5.13, so everyone is guaranteed a challenge. Join Peter for an unforgettable tour of California's finest sport climbing area. We have designed more technically oriented courses for a variety of police, military, and search and rescue groups, including: L.A.P.D. K9 search and rescue, Palm Springs Search and Rescue, F.B.I., U.S. Navy Seals, Marine Force Recon, and Delta Force. 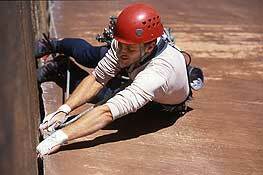 We have coordinated over 25 television commercials featuring rock climbing. We can provide location scouting, casting, rigging, and stunt coordination services. Contact us for a detailed resume.